Ingredients: filtered water, organic soybean oil, organic white vinegar, organic parmesan cheese (pasteurized organic cow’s milk, salt, cheese cultures, microbial enzymes, organic potato starch), pasteurized organic frozen whole egg yolks, salt, organic sugar, organic ground mustard seed, organic garlic powder, organic onion powder, organic black pepper, xanthan gum. Very tasty! I love it and itâ€™s one of my favorite! Tastes exactly the way cow farms smell. That smell when you drive by a cow farm... tastes EXACTLY like that. So gross, and absolutely zero semblance to a Caesar dressing taste. I really did not like this dressing. It does not taste like ceaser. It tastes like a barn. Like a poopy barn. Would not reccomend. Really lemony taste and overall quite bad... I don't have it in me to give one star or I would. Great natural option for my family! Very impressed with the taste and so was my husband and toddler. I just used this dressing on a salad yesterday for the first time and I am very impressed with the taste. I will be ordering more from this company now that I know that they manufacture such a delicious and healthier product. It would probably taste great as a dip for vegetables also since it is so rich and creamy. 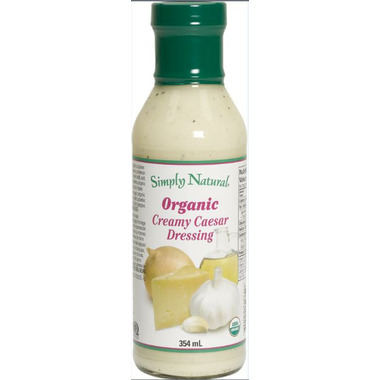 Yummy dressing, nice and creamy. I was impressed with the price and quality. Love the taste, the thin texture makes it cover well. And it's organic!!! I love this dressing, it's the perfect caesar dressing. I buy it all the time!! This is a great tasting salad dressing. Very creamy. Will be buying it again!